Seismicity along the western part of the Eurasia–Nubia plate boundary displays very complex patterns. The average motion is transtensional in the Azores, dextral along the Gloria transform zone and convergent between the SW Portuguese Atlantic margin and the Ibero-Maghrebian zone. To constrain the factors controlling the seismicity, we provide a new seismotectonic synthesis using several earthquakes. We show that the study area can be divided into six different regions, with each characterised by a coherent seismicity pattern. The total seismic moment tensor and the average slip velocities are provided for each region. 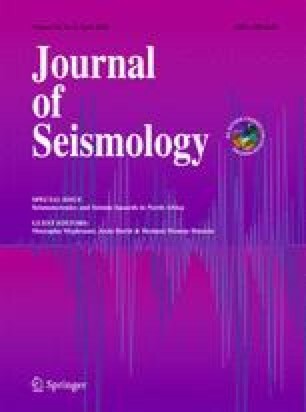 To determine the spatial distribution of the seismicity, we computed the slip vector for each earthquake based on its focal mechanism and compared it to the relative velocity between the Eurasian and Nubian plates, deduced from global kinematic models. Despite local departures in the Alboran Sea and near the Mid-Atlantic Ridge, we found a good correlation between these two independent vector sets. Quantitatively, the slip velocities display a linear, non-affine correlation with the norms of the relative kinematic velocities. The norms of the slip velocities also seem to depend on the tectonic regime and on the morphology of the plate boundary. This work has been developed with the support of 1) the Fundação para a Ciência e Tecnologia (FCT/MCTES, Portugal) through the projects PTDC/GEO-FIQ/3522/2012, PTDC/CTE-GIX/101852/2008, PEst-OE/CTE/UI0078/2011; 2) the “Agence Universitaire de la Francophonie (AUF)” through the project “Coopération scientifique interuniversitaire (PCSI)”; 3) the Ministerio de Ciencia e Innovación (Spain) through the project CGL2010-19803- C03-01. CA is “Ciência FCT researcher” funded by the European Social Fund and MCTES Portugal Funds. This article benefited a lot from suggestions provided by two anonymous reviewers.